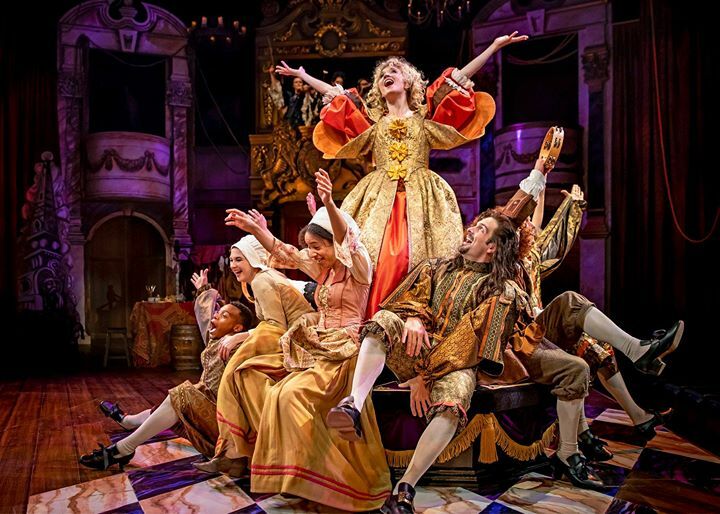 The company performs an exuberant song and dance number in Chicago Shakespeare’s North American premiere production of “Nell Gwynn,” directed by Christopher Luscombe, in the Courtyard Theater, September 20-November 4, 2018. Photo by Liz Lauren. Each month, we reach out to our theater partners across the US to see what they have onstage. This month, we visit Comedies of Errors in San Francisco and Annapolis, check in on the North American premiere of Nell Gwynn in Chicago, and get ready for plays by Shakespeare’s contemporaries in the Mid-Atlantic. At the San Francisco Shakespeare Festival, a touring production of The Comedy of Errors finds modern parallels. Director Carla Pantoja writes that the production is “absolutely about holding up the real stakes and the very real cost of family separation.” In the play, two pairs of twins are separated soon after their birth. Two of the children (who grow up to be Antipholus and Dromio of Ephesus) are taken from their Emilia, their mother, after a shipwreck. Emilia later says that Corinthian fishermen “by force took Dromio and my son”—a forced separation that later leads to the play’s madcap multitude of mistaken identities. 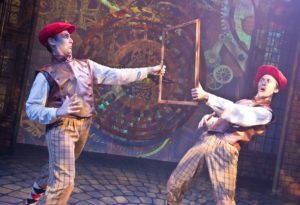 Pantoja’s production uses the play’s slapstick antics to “underline how ridiculous boundaries can be. It is comical that these two sets of twins are identical, in a city where one has status and the other is ‘illegal. '” Public performances start October 20; visit their website for a full list of dates. 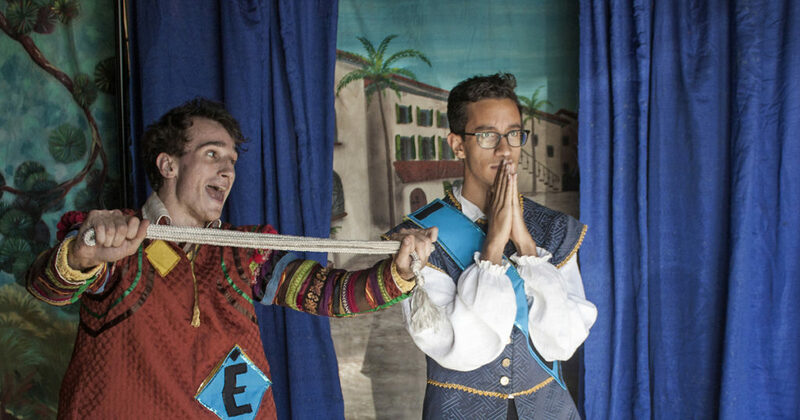 The Annapolis Shakespeare Company’s “The Comedy of Errors.” Photo: Joshua McKerrow. The American premiere of Jessica Swale’s Nell Gywnn at the Chicago Shakespeare Theatre is a “a visually spectacular evening” with “plenty of tongue-in-cheek laughs,” says the Chicago Tribune. 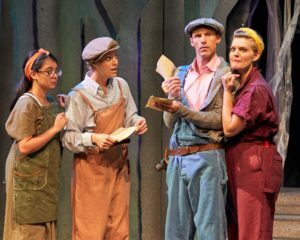 The Mechanicals: Snug (Bianca Phipps), Robin Starveling (Sarah Brown), Francis Flute (Matthew R. Olsen), and Bottom (Katie Becker Colón) in “A Midsummer Nights Dream” at Nebraska Shakespeare. Nebraska Shakespeare’s touring production of A Midsummer Night’s Dream continues. The production flips the genders of the play’s four central lovers (now Lysandre, Demetria, Helenus, and Hermian), looking to “explore what the chased and the chaser, the desired and the disregarded feel like in different bodies and with different voices.” Catch public performances on October 16, 21, and 23. Later this month, Brave Spirits Theatre in Alexandria, Virginia brings you the work of two of Shakespeare’s contemporaries with its Lunatic Rep: alternating performances of John Webster’s The Duchess of Malfi and Middleton and Rowley’s The Changeling, with one cast of actors doing double-duty. The two great Jacobean tragedies—one of which features a werewolf—kick off October 18. There’s more Thomas Middleton to be had in Baltimore, where the Baltimore Shakespeare Factory opens A Chaste Maid in Cheapside on October 26. At Mesa, Arizona’s Southwest Shakespeare Company, Shakespeare’s Pericles and a world premiere adaptation of Frankenstein open in repertory on October 26. The theme for the company’s 25th Anniversary Season is “Better Strangers” (from a line you may recognize from As You Like It); together the productions ask big questions about how we treat one another and how we can be better humans. A cast of thirteen actors takes on the over-sixty roles in Pericles and Frankenstein. There’s still time to get tickets to the Nashville Shakespeare Festival’s Pop-UpRight Shakespeare reading of The Taming of the Shrew on October 20. Unfortunately, we can’t tell you where the production will be… Check out our recent post to learn more about these “upright” staged readings in secret locations. The Annapolis Shakespeare Company, Baltimore Shakespeare Factory, Brave Spirits Theatre, Chicago Shakespeare Theater, Nashville Shakespeare Festival, Nebraska Shakespeare, San Francisco Shakespeare Festival, and Southwest Shakespeare Company are theater partners of the Folger Shakespeare Library.